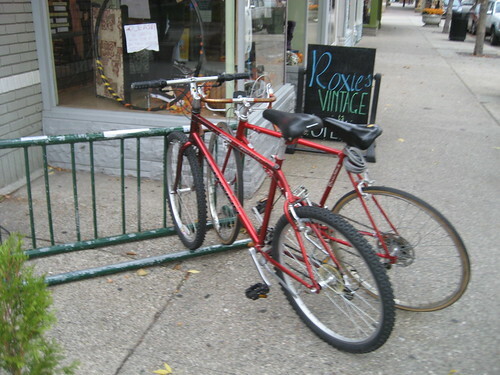 We’ve always been bike fans, even in the days when there were only two of us and this was our parking lot outside coffee shop “office”. While I usually bike in to work, much of our team drives. So Ray, our resident bike expert, came up with the great idea of having bikes in the office for anyone to use. They arrived a few weeks ago and David and Tim got them up and running. We currently have 3 and we’re excited to see how they get used. We picked Mixte bikes from Papillionaire out of Brooklyn. They’re a good size for everyone, and easy to get on no matter your height. We added quick-release seat clamps for quick adjustment. So far, they’ve been to the lake, new restaurants, the Farmers’ Market, and all over town. We added the baskets to make sure bringing back gyros is even easier. Wave hi if you see us around town!